If you've been reading my blog since the New Year, then you'll know that one of my goals for 2018 was to try out some more hair care that works for my locks. 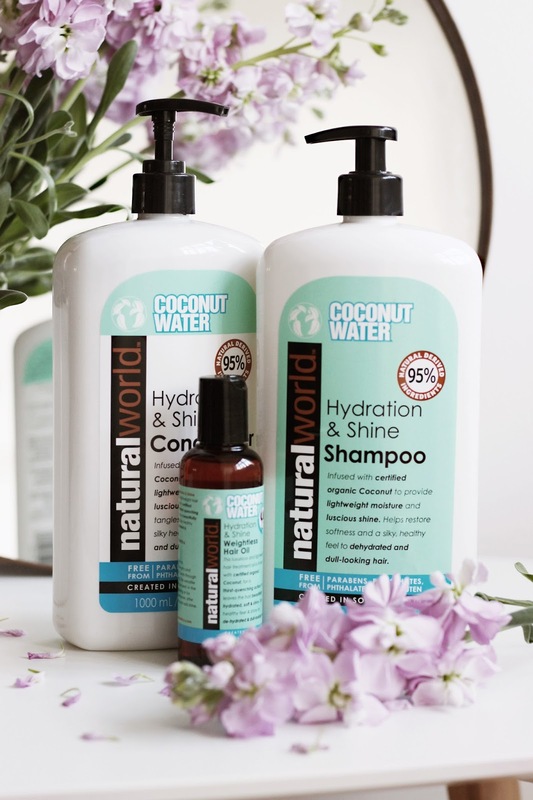 The Natural World Coconut Water Range sounded right up my street; thirst quenching, affordable and shine boosting. The Coconut Water Shampoo was the product I was most excited for- yet the most anxious about -as my hair is ultra fussy and I always worry shampoo will leave it feeling slightly sticky and weighed down. The fact this contains 95% naturally derived ingredients really enticed me in and from the get-go I was honestly smitten; it cleaned right to the roots, making my hair feel swishy, yet not dehydrated in the slightest. It makes your hair smells incredible too, not so overpowering that it'll interfere with your perfume, but it's still there whenever you catch a whiff of your locks. As someone who dyes their hair often, I like to give it some extra TLC when it comes to conditioner, leaving it on for a minute or two and always following up with a treatment post-hair wash too. I suffer with fairly dry, lacklustre hair especially towards the ends, so the Coconut Water Conditioner has fulfilled my needs. I've tried it as part of my reverse hair washing method, using conditioner before shampoo and it's worked a treat and keeps my hair looking great for longer (and not needing a wash as often!). I put the Weightless Hair Oil through the ends of my hair after shampooing and conditioner, but before I left it to dry. As someone with curly hair, my locks can feel a little bit flyaway and frizzy, so this has really helped to keep them as sleek as possible ready for drying. I've actually used it through the front of my hair too and I haven't got that annoying 'greasy look' that you can sometimes get with hair oils. You can buy all Natural World Products from Tesco and Natural World here. Have you tried any Natural World haircare ranges?